Unleashing demos from the early 60's, Crazy features some of Nelson's first demos, seeing the light of day for the first time, digitally restored and re-mastered. 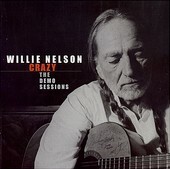 The first half of Crazy: The Demo Sessions finds Nelson on his guitar, his voice the only other companion, except for the occasional accompaniment (pedal steel on "Undo The Right"), while the second half features Nelson with a studio band. Though many of these songs have been re-cut for other records or other sessions, these are the original recordings, holding up the integrity of Nelson's original compositions. Sweet country and danceable honky-tonk, Nelson's lyrical insight and lived-through-it songs make you hear everything that country music has to offer, the best of it coming to the surface and, for a moment, overshadowing the gluttony, overproduced counterpart, Nashville's pop passed on as "country". Sugar Hill reaches deep into the vaults to offer a Nelson treasure and Nelson fans will rejoice, because here is a collection of solid songwriting and more-than-able recordings that do the songs justice, making you wonder why some had to be re-cut and re-tooled for later day sales. I'll give this an A+.